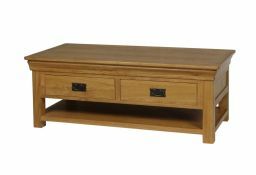 The Country Oak large 4 drawer coffee table with shelf is manufactured from a sustainable American Oak. The oak is then finished with an oiled wax which brings out the natural beauty and the characteristics of the American oak. 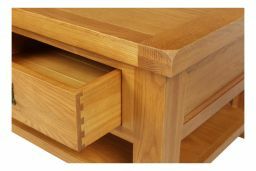 The four drawers are manufactured with dovetail joints for durability. The large shelf is ideal to store items such as books and magazines. This unit consists of two larger drawers which open up on either side to give you the four drawer storage space. Delivered fully assembled and ready to use. I love my new furniture! Really good quality products which look beautiful in my new home. Excellent customer service and quick delivery. This is a beautifully designed and well-made coffee table. Drawers are big enough and the shelf underneath is perfect. It looks great in the living room between two sofas. I am delighted with this purchase, and would definitely recommend it to others. Quality coffee table. Highly recommend. Great value. Delivered on time in Perfect condition. Very pleased with it. Goeseith the other prices I already have very well. love it very much! It arrived on time - delivery men were great and it is now taking pride of place. A beautiful addition to the house! 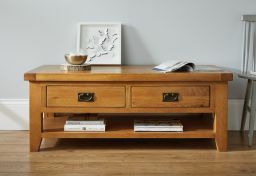 Ordered the Country Oak Large 4 drawer coffee table withe matching 12 drawer sideboard/chest. They have both arrived today and we just love them both, great quality, fast delivery, just over the moon with the design of the coffee table and the sideboard. Would recommend Top Furniture to everyone if they want style, real wood and at a wonderful price. Unit matches a fish tank stand we have perfectly, that we bought previosly from somewhere else. Delivered in a box, well protcted and fully assembled. Looks realy good, heavy, well made ,no defects. Phoned with delivery day and half hour time slot from office, phoned again day before by delivery driver with 15 minute delivery time shot. Delivered one minute early as the very polite and helpful delivery guys were a head on time. One of the best companys I have ever delt with,the whole purchaising and delivery experiance excellent. Have now ordered matching TV unit. A big thank you to all who delt with my order you deserve it, very happy and satisfied customers John and Nicky. 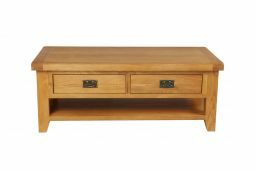 A lovely Oak coffee table which we are pleased with, I did think that it had 4 separate drawers and then I would have rated it as a Very Good, however the two long drawers are not a disappointment. Size is perfect. Very impressed with the service and quality of the product. Delivery driver very helpful. The pictures online where very accurate and the coffee table is exactly what we were wanted. I don't like buying furniture online without seeing it first, but took a chance on this as it looked good and was a good price. Very glad I did as it is even better than expected. The table is very well made and very heavy. Both draws open either side of the table and the finish is very good. excellent table, beautifully made and really happy it makes my new house just right! My table arrived promptly and is just as advertised. It is good-looking an very heavy! All in all an excellent buy. Excellent service and the table is as good as it looked on the website! Thoroughly recommended! Great quality, good value and prompt delivery. Really enhances our lounge. Excellent quality, lovely grain, good size. Very solid piece of furniture. Very attractive piece of furniture. Fully assembled, well packed. Good value. We are very pleased with the quality of manufacture and the beauty of the wood. It fits in perfectly allowing us to store regular board games on the shelf and puzzle books and pens in the drawers which often fell onto the floor with the old table. We have had compliments from family members who have admired it. Really glad we ordered it from you. We are including a photo of it in place in our conservatory. 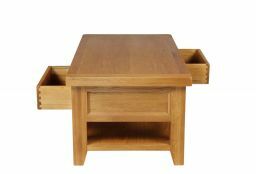 From the product description I anticipated the table would have two drawers each side but it has just two drawers which can be accessed from either side. This design means the drawers are much larger and offer better storage options. Ordering was easy and delivery excellent. overall very pleased with the product and service from very helpful staff. Looked all over for a new coffee table and finally found this which was a perfect size. Ordering simple and arrived earlier than originally quoted. Kept informed at all times and the service was good. When it was in the room I was more than happy with the quality of the piece. Overall very happy with my purchase. Good quality and fully matches the description & pictures seen on internet. 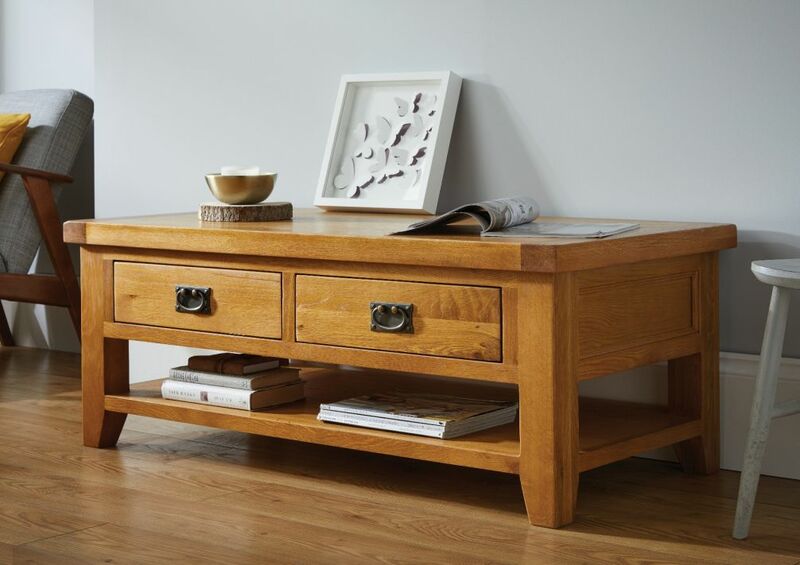 Quality product and excellent service with significant savings when compared with the leading oak furniture chains. Would definitely recommend. A solid good looking piece of furniture. It looks fantastic in our living room. Large, quality piece of furniture. Very pleased with it. We are very pleased with our purchase. The quality is excellent and the price very good. I wish we knew about you a couple of years ago after we spent a fortune with a well known oak furniture company. If we need any other oak products we will shop with you again. Extremerly pleased with my purchase, quality good, looks even better then what I visualised online. Quality seems to be very good , dovetail joints on drawers so should be a piece of furniture that you can move and have for years. Like the drawers can be opened both sides and also had middle bar so they cannot be pulled completely out by small children. Value for money quality piece of furniture. 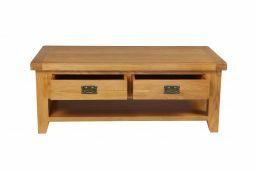 Good solidly built coffee table, it's a great size to rest papers, cups, teapots etc., and the drawers are big enough to stow the kid's junk so it doesn't clutter up the room. Well made with no problems that I can detect having owned it for several weeks. Compared with some high street prices this was excellent value for money. 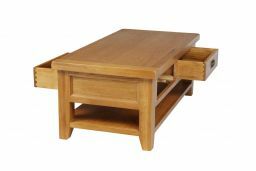 A beautifully designed table that fits into our large sitting room perfectly. This was important to us because most of the other designs were obviously too small for our room. It has all the features we like without being too over-designed! Incredible value for money. Jane & John Renfree. 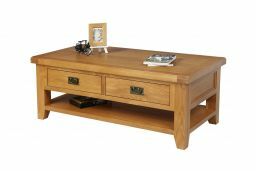 I am absolutely thrilled with my coffee table , very good quality and a good price , it also came very promptly ,would defiantly use this company again . 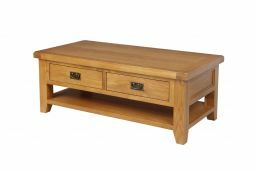 Very pleased with my new coffee table,it is very well made and good value for money as I compared with other companies on the internet.The drawers are useful for containing all the clutter that gathers on the surface of tables then just looks untidy.The colour and grain of the wood is very pleasing to the eye. Over the moon with our products from Top Furniture. Bought the tv stand too. Excellent quality & looks lovely in our lounge. Going to start saving for some bedroom furniture now!! Table meets all our requirement and features as are stated on the on-line advert. Build quality is acceptable although an inset top panel has not been fitted totally flush in one area. Value for money seems good compared to other products I looked at. Asked NOT to mention delivery but feel I must comment on: - great surprise that transport from van to door was done by just one man, rolling the large package end-over-end across a gravelled drive, despite a second man being available to help carry it. Fortunately no apparent damage occurred. - Because of the way package had been handled, I wished to inspect it for possible damage, but driver told me they could not wait and, in event of any problems, it was my responsibility to report it to the company. 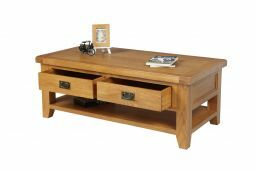 A solidly constructed coffee table in a light oak that matches well with my other pieces. The drawers are large and accessible from either side. Useful shelf underneath. It's a large piece of furniture so if space is a premium, go for the smaller version, but this size suits my room. Came well packaged so no marks or scratches. Delivery was on time and the driver was polite and helpful. Recommend highly. 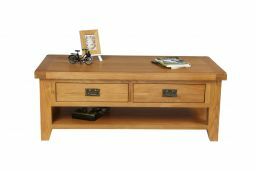 EXCELLENT PRODUCT WELL MADE, SOLID WOOD THICK TOP LOOKS VERY IMPRESSIVE IN SITTING ROOM.